The largest of the four inhabited Balearic Islands, Mallorca has been a tourist destination since early in the last century. The island is approximately 120 Km long with most of the resorts and population along the southern coast. The landscape, along with the other Balearics, is varied, with mountains, woodlands, fertile plains, sandy beaches and cliffs. 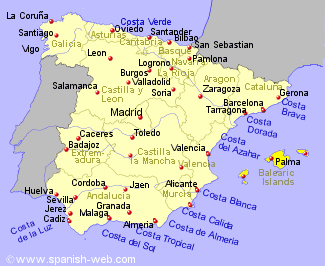 We have self catering holiday rentals in Mallorca in or near the following towns. The second largest of this group of islands, Menorca is no more than 20Km across, ensuring that you are never far from the coast. The island however has a diverse landscape has not seen a high influx of tourists. We have self catering holiday rentals in Menorca in or near the following towns. The nearest inhabited island of the Balearics to mainland Spain, Ibiza lies approximately 160 Km off Valencia. With diverse scenery on an island surrounded by beaches of golden sand, this has been a popular holiday destination for many years. We have self catering holiday rentals in Ibiza in or near the following towns.